For two weeks I've been thinking about aluminum foil. The problem is that my thoughts should have been focused on tin foil because that, you see, is what purportedly provides the best shield against alien mind control. At least that's what I've read on the Internet. This is not simply a matter of research. This weekend, I'll be chronicling in writing and on video the Retro UFO Space Convention at the Integratron in the Mojave Desert. I'll be chatting with the abducted, drinking in the wisdom of guest experts on extra-terrestrials and listening to some UFO performance poetry. But it was the "Tinfoil Hat Contest" that hit me like a gigaton of space balls. Although I didn't even know what the prize was, I wanted to win. 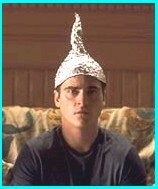 Foil hats got a pop culture bump in the 2002 thriller, "Signs," when, in perhaps the film's funniest scene, Joaquin Phoenix donned aluminum headgear to keep his thoughts protected from unseen aliens. But in my Web sleuthing I found that the coterie of the aluminated is of two minds. Anecdotally speaking, some feel that tin foil provides a shield to thought invasion by both aliens and, dare I say, the CIA. Others contend that the thin metallic sheets are actually more of an "antenna" for other-worldly communication. See Also: "The Aliens Came Back To Landers on Saturday"